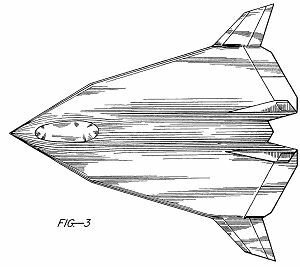 Looking through the United States Patent and Trademark Office, i found quite a few aircraft designs relating to northrop and Lockheed over the past several years. Some of you may have already seen some of these patent drawings on other websites and publications. Please be patient in loading time, there are quite a few files on this page and so some systems may take a while longer to load than others. Looking at some of the dates of when these were patented and filed, they are new programs. Some of course are probably cancelled even before they start properly designing it, others, like some of which you will see here may well be flying, as some eye witness reports suggest this. Patent was issued on November 16th 1999. This design has got to be the most fascinating to come out of the patents we shall look at here. Several witnesses have come forward to me saying they seen an aircraft with forward swept wings flying in southern Nevada and also Eastern California. Without photo evidence its hard to get the jist of what exactly they saw but looking at the patent above, we might get an idea. The date is 1999 which means if the aircraft is actually being developed, then it probably has not flown yet. But, and this is a Big but, we have seen patents released many times after the aircraft has actually gone into testing and even production for that matter. This aircraft above could of been flying for a few years and maybe the main Northrop Grumman program up and running at the moment. Another thing we have to consider is that alot of designs are cancelled even before they get off the drawing board. 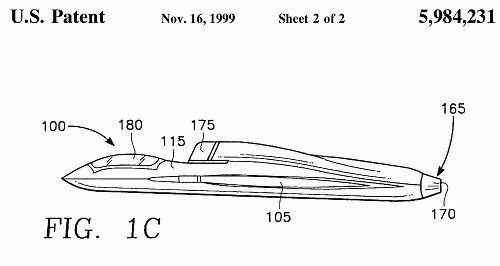 On this drawing we can see that the designers at Northrop Grumman have been designing a forward swept wing stealth aircraft with variable geometry. When Fully back(top drawing) the aircraft flies like a conventional aircraft, able to land on carriers, cruise at subsonic and supersonic speeds easily and retain the aircrafts agility. In this mode the aircraft maybe designed for air-intercepts and air combat maneuvering. On the bottom picture, we can see the aircraft's wings are fully swept forward. This makes the aircraft into a Delta configuration, enabling high speed transition into supersonic flight easily and also to cruise at low level without being buffetted by ground effect. This configuration also generates tremendous amounts of lift to the aircraft. What Northrop may of been designing here though is another configuration, and thats Stealth. When in this mode, the lines of the aircraft represent a nice stealth shape, making it much more stealthier than when its wings are fully open. We can see that when fully swept forward there are no visible gaps between the canards on the fuselage and wingtips, making it a Delta wing. This will reduce the overal radar cross section of the aircraft. Having no gap between the wing tips and the Canard foreplanes makes the Canard into a new leading edge of the wing. This in turn makes a very large Leading Edge Root Extension or LERX. This dramatically improves high alpha and agility of the aircraft making it good for low speed, good handling and very high alpha moves (high angle of attack or AoA). You may of seen the F/A-18 do a very slow low flypast at an airshow, this is characteristic of the LERX it has which improves lift and high alpha to the wing. However the Hornet has a dedicated fixed LERX, which is much smaller than the LERX on this aircraft, becuase it acts as a foreplane aswell as an extension to the wing root. the Canard would be fixed when in this mode, and then let loose again once the aircraft sweeps backwards again to act as a proper moveable Canard Foreplane. Once fully swept forward, the ailerons and flaps become the leading edge spoilers of the wing and appearing from inside the fuselage come a new pair of ailerons and flaps to take their place. This is a very clever design. The tail-planes of the aircraft are actually blended into the fuselage and are not movable. Instead the tail-planes have elevators attached, just like a conventional aircraft. When the wings are fully open, the aircraft is very characteristic with the Russian made S-37 Berkut which is also a forward swept wing aircraft design but incorporates no variable geometry. It has however a limited low observable airframe/configuration. Not forgetting the X-29,Northrops own forward swept wing test aircraft which was based on the single engined F-5 Tiger Shark. It was being tested at Dryden Research Centre for some years until the mid-1990's. This could of actually have had an extremely important descision to whether the design here went ahead or not. This is the side plan view and shows the same configuration as the design above, with the air intake on the dorsel. clearly visible is the lack of any vertical tail-plane. NASA have been conducting trials from Dryden Flight Research Centre of a No-Tail-Aircraft and this has turned out to be OK in flying characterisitcs based on the X-31. The cockpit looks as if this is a two seater, and so could be used for Strike/Recce as a primary mission with secondary air-air capability. Here we can see an added vertical tail-plane for stability but no change in the design of the fuselage. This adds Yaw to the aircraft and so this is what will be used probably, as Yaw is a vital tool for landing in a cross wind. Without any tail, it cannot Yaw, except by using its engines independantly which is not good in the case of landing. Now changing design, the air-intake has been added to the bottom of the fuselage, with no vertical tail-plane. Changes to the fuselage will have to be made to have this design, not just for the air-intake being re-located. Engine auxillery intakes will have to be fitted so that Foreign Object Damage (FOD) does not ingest into the engines. Looking also at these side view images, we can see a chine of some sort extending from the nose tip to the canard fore-planes. This increases horizontal stability and gives slight lift to the aircraft. A strange one this. 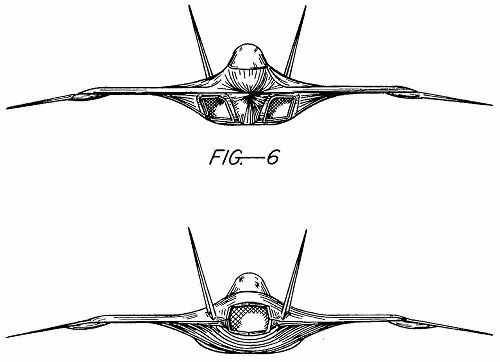 When looking through the patents that came under Northrop this one turned up, but registered to Lockheed Martin. However referenced to the findings, there was file referred to as 'Building the B-2A' with Northrop and also a reference to an advanced fighter. Looking under Lockheed, the same patent turned up as the same number. The Date of this Patent is August 26 1997. 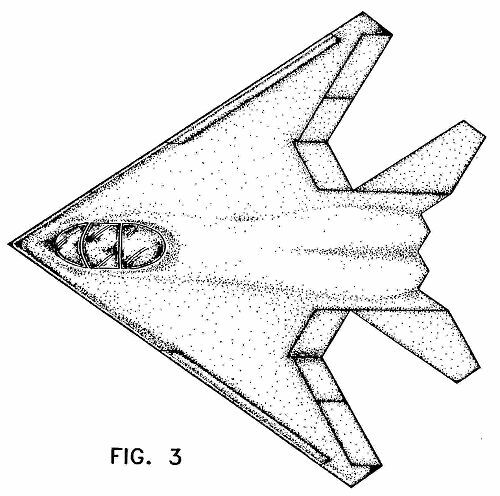 The reference to the B-2A Program was in 1995 - 1996, after the program had been white and before this patent was released. 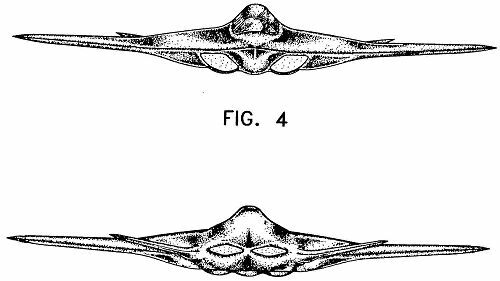 The patent above is characteristic of the Northrop B-2A Design but it is a Lockheed Martin Unmanned Aerial Vehicle. I put this here because it came under Northrop aswell as Lockheed and it gives the general idea that indeed Lockheed Martin are using a UAV in the same configuration as the B-2A Bomber of Northrop. I shall not repeat this in the Lockheed Martin Section. Looking at the drawing we can see the air-intake at the front of the upper fuselage and the engine in the upper rear of the fuselage to reduce underneath infra-red signature. Looking at the side view, it is a rather bulging and bulbous design but again it still is characteristic of the B-2A bomber. Patented in 1995 this concept from Northrop has been seen around various places and websites. It is believed that this AMC actually got to Prototype stage with one actually flying although we are not sure about that. I once saw a Royal Air Force video showing the future RAF, and very surpringly this AMC, but in Desert Camouflage popped up on the video as maybe one of the Future Offensive Air Systems(FOAS). Along side it was Russian built Su-37 Flankers, which it is believed the UK were thinking of buying as an interim for the Typhoon some time ago. So, with this AMC actually on a force video, is this a joint venture between British Aerospace Systems and Northrop Grumman for the FOAS? We can see in the image that the wing-tips are variable geometry, the air intakes are underneath the fuselage and overall we have a delta configuration and a sort of 'Manta' shape. The cockpit seems to be a single seater. The underneath view of the AMC, intakes clearly visible. The aircraft is a single engined design. Now we can see the wing tips are clearly some sort of variable geometry and are swept forward and aft. Looking at the wing tips, these have aerilons or they could be spoilers and on the front of the wing tips we do have leading edge spoilers. The larger ones on the main body look to be both Elevators and flaps. The overall design is that the actual body of the aircraft acts as a lift platform and the winglets are designed for enhanced agility and overall movement of the aircraft in the roll axis. To the right we have the plan view of the AMC. If the wing tips are of variable geometry we can see that when swept backwards, they make the aircraft into more of the delta it already is. On the left hand side, Clearly visible are the rotational appearance of the wing-tips. This is the underside of the fuselage showing the two air intakes at the front of the fuselage under the nose with the nose gear bay inbetween the intakes. The right image shows the side view and the sleek lines of the AMC. The air intake can be seen below the cockpit on the underside fuselage. A small chine is extended from the nose back to the actual winglets. The vertical tail-planes are clearly used for Yaw and stability and not just for Yaw like in the SR-71 etc. From looking at the single seat cockpit, it is clear that this aircraft was designed as a fighter, with good all-round views out of the cockpit. It is perhaps then used as a strike platform for a secondary mission. All Weapons would be carried internally in a dedicated weapons bay and so the aircraft would not be able to carry an exceptionally large load of air-ground weapons, which is why i think this would be the secondary mission profile. A weird front/back configuration , the front more resembles a Mig-29 than anything else if the intakes were independent and not embedded into the fuselage. Looking at the wings we can clearly see the wing-tips are drooped down slightly, these may also be designed to actually rise or tilt lower further. The Engine exhaust is quite large, and an unconventional rectangular shape, seen in aircraft such as the F-22 Raptor. I can safely say this aircraft would not do time with the U.S.Navy, with just one engine, it has not got a hope of making it back if it fails as the USN have to have a long ranged interceptor capable of flying well over 500 miles from the Carrier.. However it is a likely platform for use with the Royal Navy and the U.S.M.C. They already have single engined fighters in service on carriers to provide short - medium range defence and support. Another weird design assigned to Northrop Grumman. This looks to be an advanced tactical fighter design. The wings are certainly not what we've seen before. 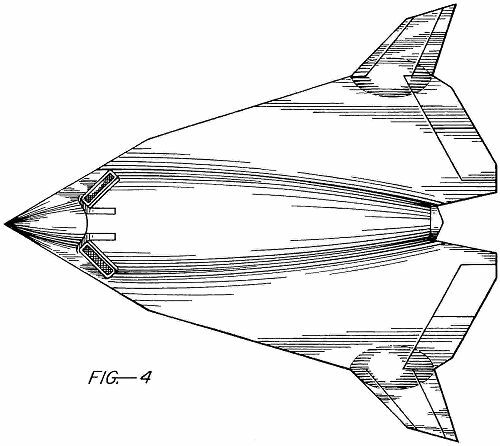 A Single engined fighter and patented in April 4th 1995 but filed at Northrop in 1993, its another recent design that could well be in development at Area 51, who knows? What is clearly visible is that the engine is Vectored Thrust. Again, the front looks more like a Russian Su-27 than anything else with a small LERX leading out from chine around the front fuselage. The LERX then blends into the leading edge wing root with a leading edge spoiler located immediately afterwards. A very unconventional wing then leads into a small type of wing-tip maybe acting as horizontal tail-planes. They certainly have elevators and flaperons. It is a single seat fighter design with good all round views out of the canopy, clearly aimed at Air Superiority. Weapon location is probably internal under the main fuselage. You can clearly see the Two Dimensional Vectored thrust engine nozzle now and the design of the wings. a Very strange looking aircraft that will indeed need several computers to keep this aircraft flying, or for that matter , taking off and landing. The vertical tail-planes seem like they maybe used for Yaw only(Rudders). From Above, we can see the chine and LERX very clearly and from this plan form we can see it resembled the F-16 Fighting Falcon more than anything else in the front area of the aircraft. Again showing the vectored thrust 2-D engine nozzle. You can also see the Chine that extends from the noze cone back to the leading edge.. Characteristic of the YF-23 and SR-71 to add stability in supersonic speeds. Now this patent was filed in 1993 by Northrop Grumman. And accepted in 1995. Very characterictic of the Lockheed F-117A Nighthawk, this design incorporates a more slender look than the faceted design of the F-117A. 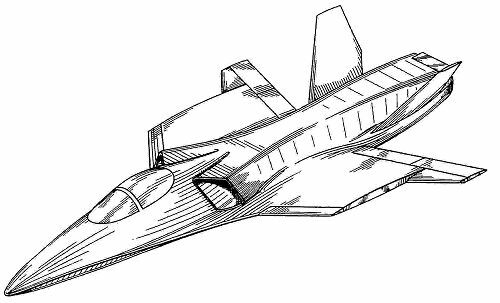 A two seat strike aircraft, this design has the air intakes under the fuselage and has the slender curves used for low observability of the Northrop B-2A Spirit. Eye witnessed around Rachel and north of that area have said they have seen an aircraft like this flying, and to be larger than the F-117A. 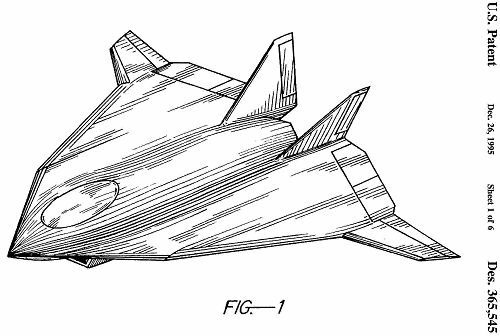 Seeing as this is a two seat aircraft it is possible that this design is maybe a 1/3 larger than the F-117A. Looking at the plan view, the configuration is very similar to the Lockheed F-117A apart from the tail section, and the two seat cockpit. Front and Back views of the design. Now looking at these two images, the familiar lines of the f-117 now disappear, and we now have the air-intakes below the fuselage in the same shape as old F-18 Hornet and F-111. The tail planes are virtually flat unlike the F-117A but similar (albeit flatter) to the Northrop/McDD YF-23A. The engine nozzles are embedded into the rear fuselage and there have not been any attempt to take away the Infra-red signature of this area. There is no way that this aircraft is designed for any air combat whatsoever because pilot visibility is at a minimum to the rear, which is a severe tactical disadvantage. It is purely a Strike/Attack aircraft. Or maybe a Recce platform. A very strange looking view of the aircraft. I actually think this has got to be one of the worse looking aircraft from looking at this view. Makes the A-10A look pretty. We can see the air-intakes just visable below the cockpit with 45° angles similar the F-117A lines to minimise radar cross section. Apart from that, the rest of the fuselage is similar to the northrop B-2A Spirit, which turned out to be a more efficient stealth / low observable shape than the faceted designed of Lockheeds Nighthawk. In view also is a visable Chine extending from the nose back to leading edge of the wing root. 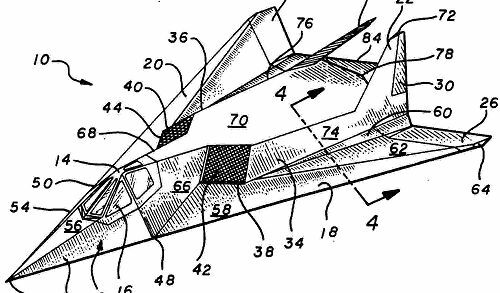 This was the patent used for the Northrops advanced Tactical Fighter design, the YF-23A which lost out to Lockheeds YF-22 Lightening, which became the Raptor. Not much else to say about this, as the YF-23A is already explained on this website by myself. A classic delta configuration and a flying wing. This design was reinstated after the Spirit was released into the white world and is now a design for an unmanned aerial vehicle. Looking at the picture we can see at the front of the fuselage an air intake and extending back over the top of the fuselage the engine nacelle and the engine exhaust which is also above the fuselage to minimise infra-red signature from the ground. Two small vertical tail planes can also be seen which are used for stability and yaw. 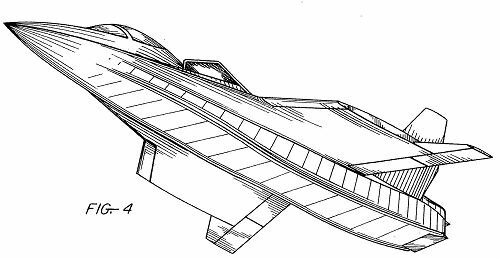 Filed in1980, this design from Northrop shows a triangular delta configuration but with an added tail section of where this is designed to slide linear outwards to increase and improve the stability of the aircraft when in possible combat increasing also its agility. It is possible that this design was in fact flown to aid in the B2A program. I have no knowledge of that however. Most of you that follow military aviation programs would instantly recognise this design. Developed and tested at Area 51 as the TIER -3 minus, commonly known as DARKSTAR. The program ran into serious difficulties with government funds being shared between this and the F-22 Raptor. The eventual outcome was that DARKSTAR was cancelled after significant testing at Edwards AFB. Another familiar sight to Military Aviation followers and if you have read my article about the F-117 being born, then you will also recognise this from there. 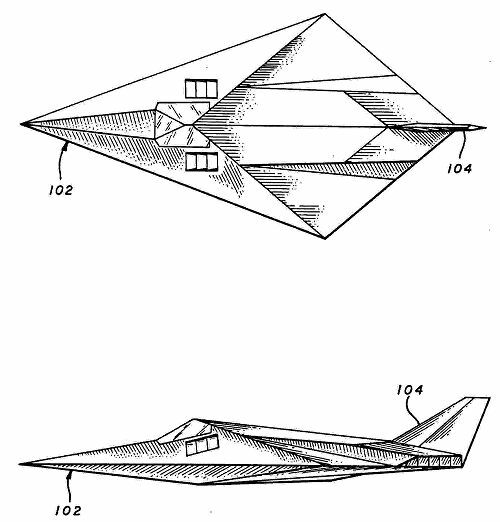 This is the patent that originally became the program for the F-117A, the HAVE BLUE. and was reinstated in 1993 as the above patent. Each patent only lasts for 14 years. And so the original patent was due for upgrading. What is strange is that his exact patent was re-instated for use in 1999 aswell as Patent Re36,298. So, last year Lockheed Martin obviously has other plans for this Design. Remember when the Have Blue was called the 'hopeless diamond'? This aircraft was the patent before the original Have Blue came out. But it was again reinstated in 1993 with the design above. Why it is under the Same patent as above i am not too sure about. I would of thought this would have its own patent number seeing as its a different design. A strange looking aircraft, with a single tailplane and embedded engine intakes it really is a hopeless diamond. I doubt this is still flying in any form of the design, but you never know with programs like these. So, what do we know from seeing the above images? Not alot. but then thats the reason they are Black Programs in the first place. 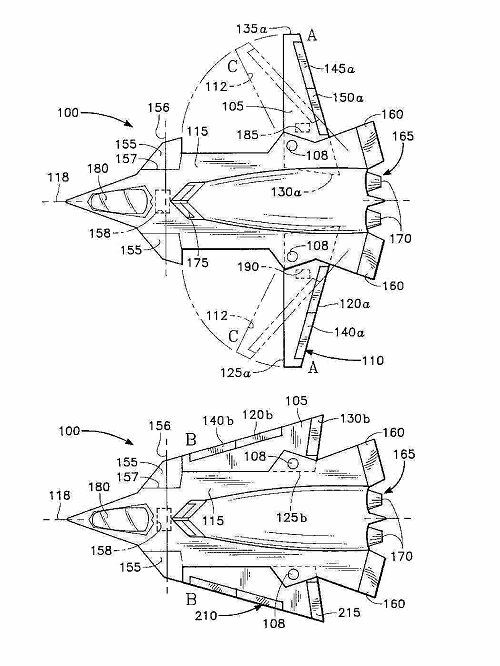 We do know however that Northrop and Lockheed are conducting various air vehicle programs at Groom Lake, that could be any one of these patent designs or designs not yet released. Looking at the later dates such as 1999, it is probable that these are indeed in the process of construction and development. The earlier dated patents may already be flying at Groom lake, and may well be in the white world in a few years time. Designs like the Patent 365,545 , the AMC are as i mentioned believed to be in prototype stages and may have well flown at Groom Lake already. It is a design that has been seen in various forms, and in various locations. Like mentioned above, the AMC has indeed appeared in the form of a mock up in a video designed to show what life will be like in the Future Royal Air Force. 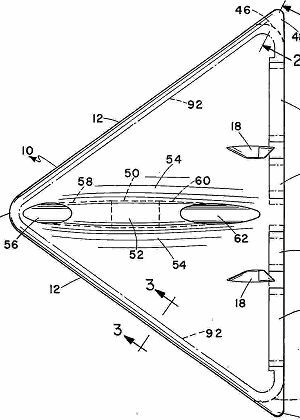 Another Patent, 5,984,231, the Variable geometry forward swept wing design has also been seen around various locations, however again with no photographic evidence. Designs apparently have been seen at Cannon AFB and the Melrose Range according to Steve Douglass of conventional backward swept wing aircraft , black in colour, but these are mythical because again, no evidence. And seeing as when the story came out about that, Cannon AFB was the main F-111 Aardvark Base of the USAF. With F-111's having conventional swing wing. However i am still skeptical in the A-17 story on whether it is out there or not. The designation maybe mixed up with various Navy designs, possibly with the first prototype of the F/A-18, who knows. According to an article done by the British magazine Aircraft Illustrated, the Pentagon was faxed a copy of this forward swept wing variable geometry aircraft and the response was of shock on the Pentagons side. They indeed were shocked at where AI had got the image and obviously did not know it was readily available at the Patents Office. Apparently according to AI, he 'clammed up' about it and was astonished that they had the patent. 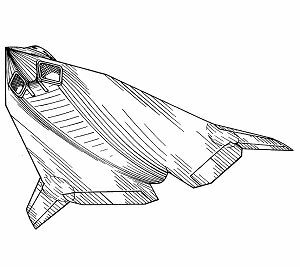 Patent: 342,717 which is Northrops F-117 lookalike has also had reports of being seen around Rachel and Warm springs, and these were also told to be the Flying Artichoke which is the same configuration except for the tail section being faceted. Again, no evidence in the way of photographs or video. 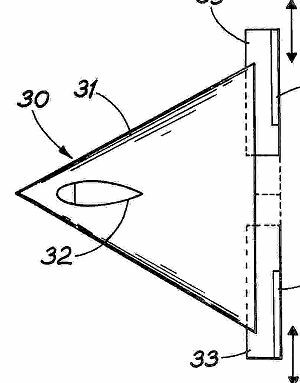 Patent 382,851 is another design people have seen flying around near Groom Lake, and they very well maybe right, this design is an unmanned aerial vehicle and could well be flying and testing at Area 51. Again no evidence is around to suggest this. Then we have patents above that have been tested at Area 51 with evidence. The most obvious is the Have Blue Patent, now in the form of the F-117A nighthawk. Another obvious one is the Darkstar, which was cancelled due to the funds going to the Raptor instead. Many reports from Nevada and California have ended up in my mail box, and many are just plain silly, but others are very viable to look at and research, especially the forward swept wing design, of which i have many reports given to me of sightings in Nevada, and not just around the vicinity of Area 51. Other reports of aircraft like the AMC and the Artichoke variant are also viable for research as there has been many reports of sightings of these in the area of Groom Lake aswell. What we do need, is when visiting the southern areas of Nevada is to have a Camera or Video Camera ready, this is the only way possible to get evidence of these aircraft flying. Wherever i go, i take my binoculars, camera and so on with me, just in case that special moment arises. I am therefore asking anyone who visits the vicinity of Area 51 to take their camera with them when driving or hiking. It is only then, we will be able to get evidence of these vehicles being tested at Groom Lake. One of the latest sightings was Meinrad Eberle's sighting up on Tikaboo Peak, but he chose to view the aircraft through his binoculars instead of getting a photograph , which would of been the most talked about and sort after photo in military aviation history...a claim to fame he very sadly missed out on.